Before I head off on a little vacation sans laptop, I wanted to share my second ornament from October. (Here's my first.) I decided to try something different with this one and bought a piece of 12x12 scrapbook paper with "Merry Christmas" printed all over it. 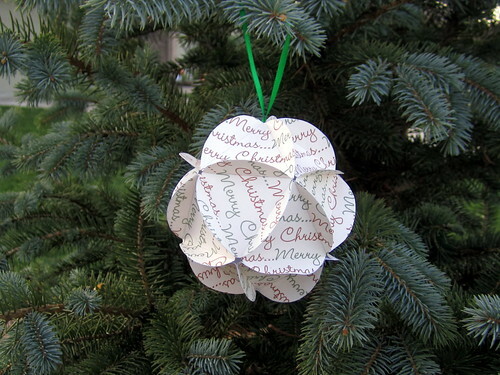 I used this tutorial from Bird's Party Blog to assemble the paper ball. I don't have a large circle punch, so the most tedious part of the process was probably cutting out all the circles. I like the print on paper design of this ornament, the dimension, and the fact that the words are going in all different directions.